Maturing Redfields in the Kingbird orchards. We served up a Redfield at the tasting, but as a sour cider apple, it wasn't one of the more popular apples, despite its gorgeous red flesh. Way back in October, we presented 19 apples at our fourth annual apple tasting party, and for the first time we had fruit from our own trees. Five of the samples came out of the Kingbird orchard. As if that weren’t exciting enough, our apples swept the top three favorites! It just goes to show you can’t beat tree-ripened fruit. 1st place: Gibson Golden Delicious, a strain of Golden Delicious that russets less than the standard. Ours had a beautiful rosy blush. 2nd place: Cortland: a McIntosh offspring, said to have a vinous flavor. 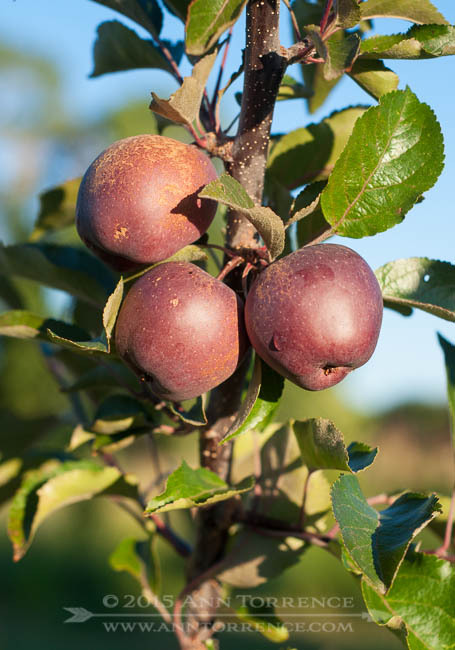 3rd place: Liberty: a modern American apple, another McIntosh descendent with vinous characteristics. Other apples that did well in the tasting were a mystery apple brought by our friend Nan from her new property in Torrey, the always popular Rubinette, and our Golden Russet. (Not placing, but pictured is the Snowdrift, an object lesson in astringency for those brave enough to try one.) After a late frost wiped out the blossoms in Kingbird this spring, we were lucky to harvest any fruit at all. The future is tantalizing: there are more than 60 other varieties in that orchard to put to the test, either on the table or in the glass. This year we are working with a local community group to make the apple tasting even better for 2016. More on that when we have an exact date. Our fingers crossed for an easy spring and a wide variety of apples to share with folks come next fall.